Home » Opinion » TG Tip: Lemons. Want to get the most juice out of your lemons? Before cutting them, put them on your counter and roll them back and forth, applying heavy pressure with the heel of your hand. This will help break down the lemon and make them easier to juice! Use a tool like a citrus reamer to get out more juice than you could squeezing with your bare hands. Wash your lemon first, then zest with a zesting tool or fine grater (I love my Microplane graters). 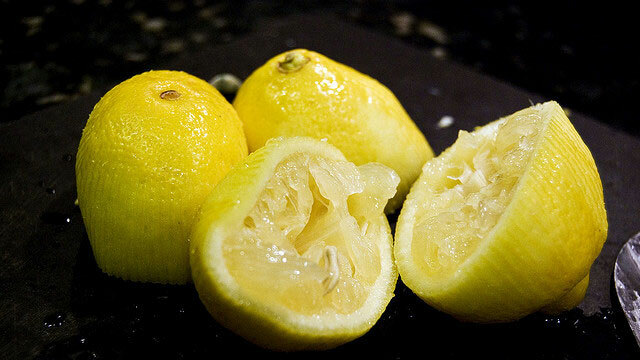 Make sure you only use the outermost layer of the lemon – the white inner pith is bitter! Want to make a great sugar cookie recipe even better? Add lemon zest to the cookie dough! It will give it a unique and delicious twist! It would also be great in blueberry muffins! Want to avoid lemon pips in your dish? There are lots of options! Squeeze the lemon into a dish first, squeeze it through a small strainer or use Rachel Ray’s tip – squeezing it cut side up! That was a typo in second line. First of all when you buy lemons try to pick the ones with thin skin. The ones with thick skin will tend to have more juice. First – You contradicted yourself in those two lines. Thick or thin? Which is it? to get more juice,warm the lime/lemon in microwave for 10-30 sec depending on ur microwave power,u get most of the juice . Let me add 2 more cents. We found it much more easier to soften the lime/lemon using a regular cutting board from the kitchen rather than bare hands (place the cutting board on the lime and apply pressure on the board while rolling the lime below). This will give you a better grip on the ball and also more easier on the hands. Thanks for the addition Rama garu.